Are you looking for some fun outdoor activities for the kids? Messy art is perfect for summer (or any time the weather is warm enough to get outside). And when it comes to messy art, splat painting is fun and takes almost no prep. 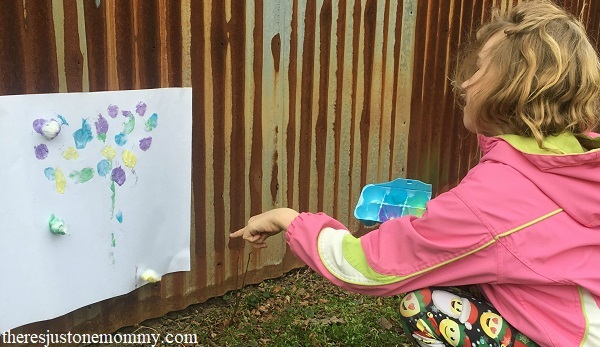 This spring try puddle painting for another low prep idea that’s perfect for a rainy day. 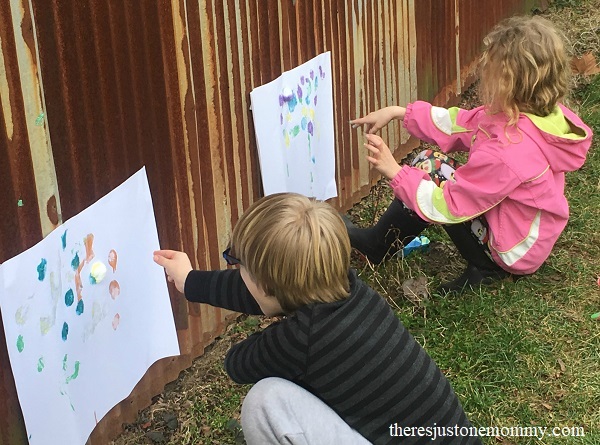 Splat painting is a process art activity for kids. It’s all about exploring while having fun and being creative. 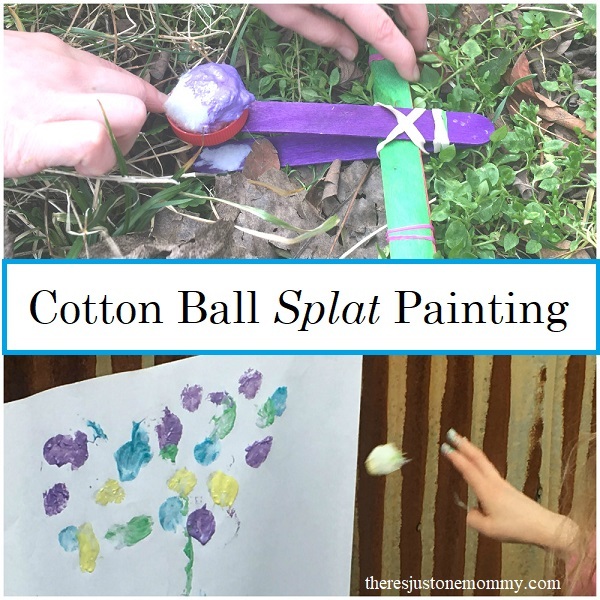 With that in mind, we came up with two different ways to do splat painting with cotton balls. The first idea involves using craft stick catapults to paint. 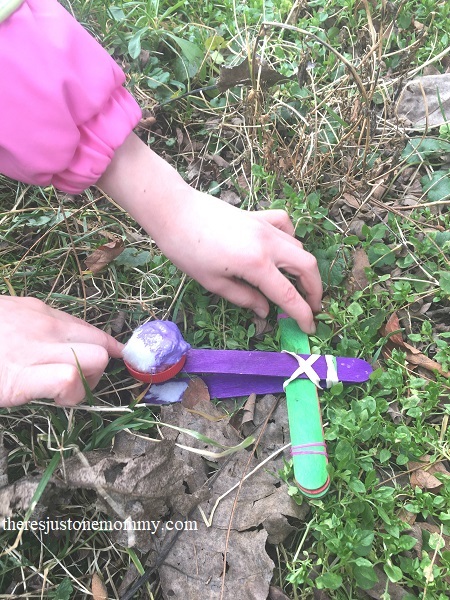 Want to make your own catapults? Follow these directions. We opted to hot glue a plastic lid to our top craft stick instead of using the plastic spoon for these catapults, but a spoon would work too. To minimize paint spills and make things easier for the kids, pour a small amount of each color paint into the cups of an empty egg carton. Dip one half of your cotton ball in paint and set it on the catapult, paint side up. Then comes the fun part. Pull the catapult back and let that cotton ball fly! Painting with a catapult involves some experimenting. If it isn’t very windy you can try placing the paper on the ground in front of the catapult. A few small rocks can help hold the paper in place if needed. Your child may need to move the catapult back and forth to find the optimal position for hitting the paper with the paint balls. You can also try taping your art paper up on a surface that you aren’t worried about getting paint on or using a small paint easel. Be ready for a bit of messy experimenting as those painted cotton balls fly! Want to skip the catapults? 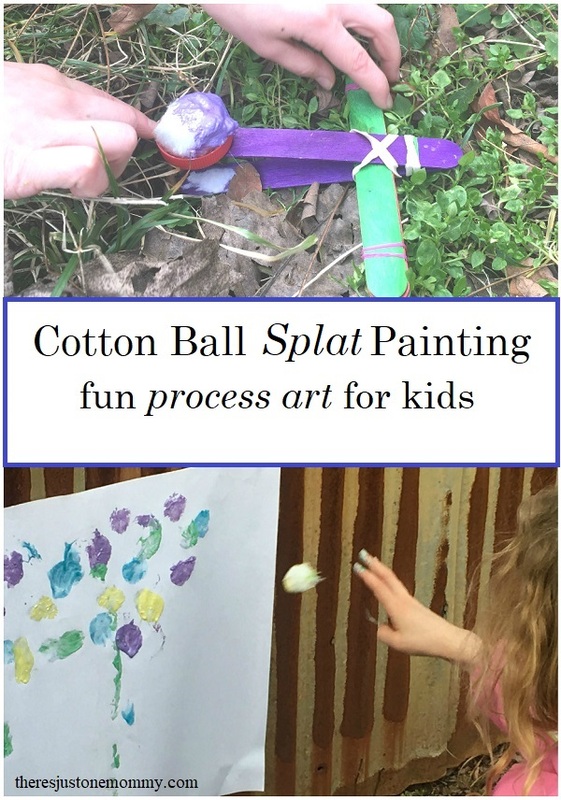 Another fun variation for this messy art activity is to just toss the paint covered cotton balls. This is perfect for younger children. They will love seeing the colorful results as they toss the cotton balls. If you have larger sheets of paper you can challenge your child to try tossing the cotton balls from varying distances. How far away can they get and still hit the paper? Be warned, this is one activity the kids may ask to do over and over. 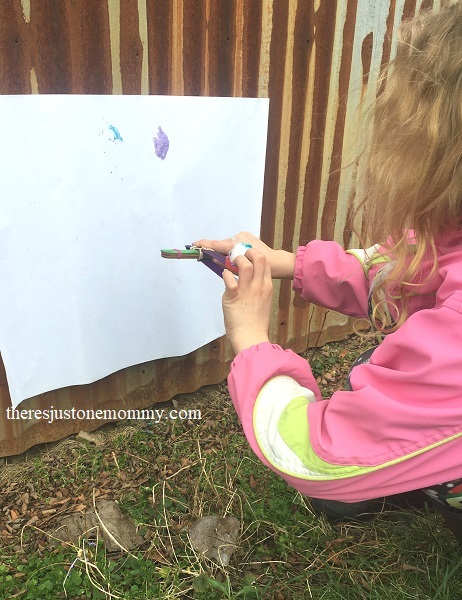 Splat painting is a fun and messy outside art activity that is perfect for a variety of ages. Try dropping the cotton balls onto paper while standing on a chair. Use a water balloon slingshot to shoot the cotton balls at the paper. How fun is this? My 18 month old loves messy activities but likes to put everything in her mouth. Maybe I can make some edible paint and use marshmallows or something that I wont have to worry about ingesting. Oh, I love that idea to use marshmallows for little ones! I’m going to add that idea to my post to help other moms of younger kids. My nephews would LOVE this – anything that is messy is right up their alley!